If your dog could choose two flavors to combine, we bet peanut butter and bacon would be close to the top of the list. You can please every dog whether they prefer sweet treats or savory, because this dog biscuit has them both. "I made these several days ago for my dog-a 13 pound terrier mix and he went absolutely crazy. He loves them and often goes to the drawer I keep them in and begs for one. Great combination of ingredients and apparently he thinks it's perfect." "They were very easy to make and they came out exactly as the picture. My dog loves them." 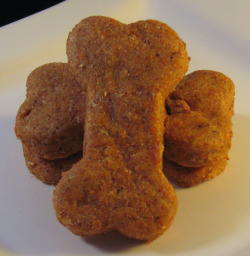 You can make several substitutions to this dog treat recipe, depending on your needs. Peanut Butter - Don't fret if your family doesn't keep peanut butter in the pantry. You can also use almond butter or cashew butter. However, skip the walnut and macadamia butter. Our dogs shouldn't have walnuts or macadamias. Ground Flax & Wheat Bran - If you don't have these ingredients or can't find them at your local store, you can omit them. You'll need to add about 1/3 cup extra of whole wheat flour to make up for them. Tuesday, January 24th is National Peanut Butter Day. Be sure to bake up a batch for your dog and all of your dog loving friends to celebrate this fun and flavorful day. January is National Train Your Dog Month. 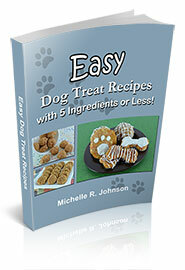 Your dog is smart, he's already trained his person to learn more about healthy homemade dog treats. :) But, every dog can learn a new trick, new proper manner or unlearn a negative behavior. For example, did you know that some dogs need to be taught how to play with toys? Did you know you could help your dog love going to the Vet? Oh yeah, that's a big one for a lot of us pet parents. Or, a simple command of coming when called. Yes, your dog will come when you have a peanut butter and bacon dog biscuit, but there are other times when you need her to come. Or find a professional dog trainer to help you and your dog learn the basics of everyday life. I love this day, because who doesn't love a sweet pup in a sweater, bandanna, or a super hero costume. Depending on the temperament of your dog, she'll love it, too. Consider participating in this day if your dog loves attention. Plus, another layer, in this case cute clothes, may help keep your dog warm this winter.